We are sitting in the van in the Czech Stop parking lot in West, Texas. Their kolaches are a must for any trip along North Interstate Highway 35. 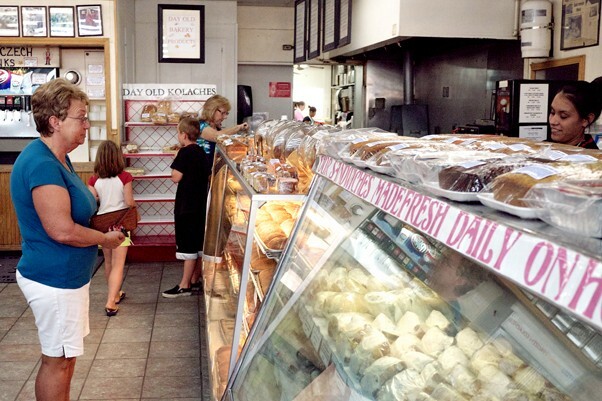 Customers at the Czech Stop bakery shop for kolaches. Nothing very noteworthy in the early stages of the drive, and then the tragedy of embarrassment struck as I mixed up my Buffetts. When told that Warren Buffett hails from Omaha, I asked if they had a big Margaritaville. Warren sounds like Jimmy, OK? Dreading the drive through “Chokelahoma” and Kansas. Our entry into Oklahoma was greeted by the smell of kerosene and a giant WinStar World Casino. No, we did not stop. It’s worth mentioning that Andrew lived in Laton, Okla. for eight years. “No, I did not,” he said, solemnly shaking his head. A few thoughts on the state so far: First, Bob Stoops deserves props for the recruiting magic he does. I know Oklahoma is a school rich in tradition and one of the best college football programs in the nation, but man, Norman does not seem very appealing. And that’s saying it nicely. We recently passed a billboard advertising that “Secretariat” was coming out Oct. 8. What a time capsule. 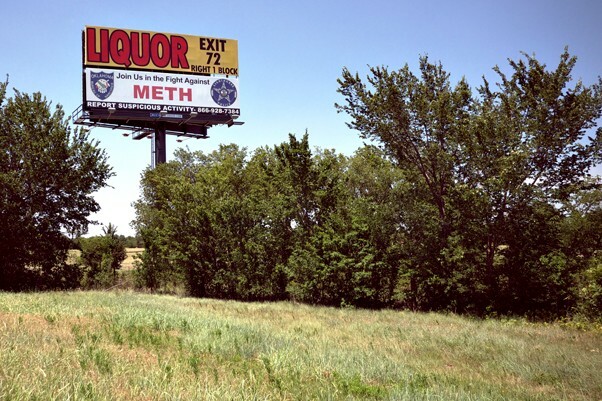 A pair of signs in the middle of Oklahoma. Methamphetamine usage has been a plague in the West and Midwest since the nineties. Public service announcements discouraging it’s use aren’t uncommon. 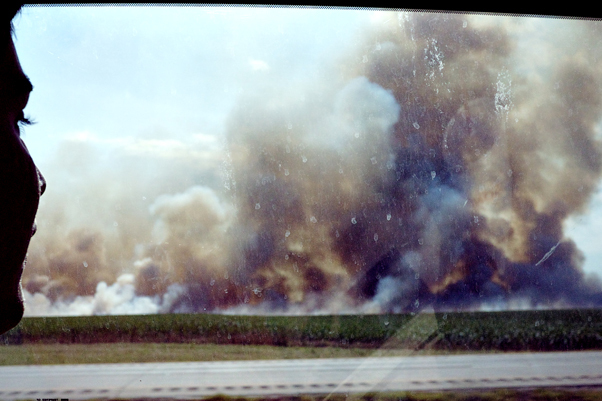 Trey Scott watches a controlled fire from a passing van outside of Tonkawa Oklahoma, near the Kansas border. The fire was on a patch of farmland and fizzled out quickly, dying out in minutes. We entered Kansas sometime in the late afternoon; I forgot to mark the time. We stopped at Long John Silver’s, not to necessarily eat the food, but to use their restrooms. We threw in a sympathy purchase — an order of popcorn shrimp and a small order of fries between the four of us. According to the sign that says, “Welcome to Nebraska,” we’re not in Kansas anymore. Finally, finally, finally in Omaha.